This is Raisin. She is a level 43 gnome Mage on the Proudmoore server. I created her a few days ago to help me cope with a horrible situation I am dealing with in real life. Like many throwaway World of Warcraft characters before her, she’s been doing a bang-up job. It’s doubtful Raisin will ever reach World of Warcraft’s level cap. She won’t go on raids. She’ll never reach the upper echelons of The Old Gods, which is the guild I joined on Saturday because I liked the name that popped up when I received a random invite. I’ve got a high level Mage on my usual game server, so I’m already familiar with leveling the class. That familiarity is part of Raisin’s charm. I take comfort in it. I’ve been playing World of Warcraft on and off since the game launched in 2004. Over the past fifteen years, the game has changed quite a bit. New lands have been discovered. The Alliance and Horde have traveled to new worlds. The Cataclysm expansion tore the old world asunder, replacing stale adventures with fresh ones. Despite the endless tweaks and reformations, though, Azeroth is still Azeroth. I know that no matter which server I roll a character on, the experience will be more or less the same. That reliability makes World of Warcraft a good place to retreat to when the unpredictable nature of reality gets me down. Last July, when I got home from a four-month hospital stay and had to sleep in a hospital bed in our living room instead of with my family, I rolled a Hunter in the middle of the night. Hunters, with their animal companions, are never alone. I could have logged in to one of my existing characters, but there’s history there. I could run into people I know. They’d want to know how I’ve been. What I am up to. That’s fine when I am feeling sociable, but sometimes, I prefer to stay hidden. My World of Warcraft server select screen now features a host of the coping characters that I’ve created over the years. Some, like Tentative the Hunter up there, carry with them the memories of whatever I was upset about at the time. Others, like my squad of “flagged for rename” characters on the Dark Iron server, are just echoes of some unfortunate event in my past. A fight with a friend, a surprise expense, a family member in the hospital. Last week my older sister, Phyllis, had a horrible accident. She fell in my parents’ garage, fracturing her skull. Her brain was bleeding. Doctors say it shifted to the left inside her head. Since then, she’s been heavily sedated. Her head is shaved, with large, nasty stitches on the left side. She opens her eyes but doesn’t seem to recognize anything. When her sedation was lowered, she wouldn’t respond to people speaking to her. There is nothing I can do for Phyllis right now other than hope and pray that she somehow pulls through. It’s not looking good. 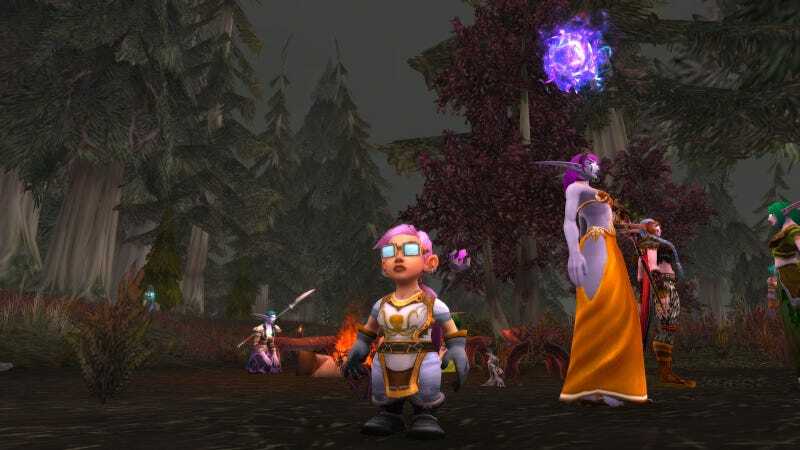 So I have a level 43 gnome Mage named Raisin. Raisin is a comfort. I know her character model. I know her spell rotation. I know what quests she is going to do. I know where she will be at level 85 (somewhere in Pandaria), though I hope she never gets there. My trauma sponge characters tend to only reach high levels when the situation that is causing the trauma hasn’t been resolved. There also might come a time when Raisin isn’t enough, and I will have to face my troubles head-on instead of head down. Maybe a few more random dungeons first.